Every November feels the same way: as soon as Halloween is over, it feels like the end of the year is creeping up on you faster than last year, and you’ve got about a million things on your mind, from your own holiday plans to where you’re going to host the annual end of year party for your team. Hosting a great office party at the end of the year is an important way to recognize the great work your team does and create a better, more collegial environment at the office. There are better ways to do office holiday parties than a formal dinner and drinks – something people inevitably complain about or make fun of every year for being so awkward. Even though these are people you see and work with every day (in fact, about 50% of all professionals spend more time with their colleagues than their friends and family), water cool conversations get stretched a little thin over a formal dinner. However, you should be careful when choosing a more active party idea, as it should be accessible to everyone in the office and still in a casual atmosphere. If that sounds like a lot to manage, never fear – in case you missed it, axe throwing is now in Ottawa and it has quickly become one of the most popular alternative sports in Canada with the emergence of leagues and private venues in cities across the country. The former Tommy & Lefebvre warehouse on Lancaster Road has been converted into the Ottawa branch of the Backyard Axe Throwing League (BATL), a popular alternative sports destination that originally brought this sport out of lumberjack competitions and into cities across Ontario. They designed a unique way to play that was easy for amateurs and started hiring instructors to teach private groups how to safely and accurately throw axes. After an hour of instruction, you start competing against other people in your group in a round robin tournament before you move into “playoff” rounds, meaning everyone gets plenty of time to both throw axes and relax, talk, and drink a beer or two. Almost anyone can go BATL axe throwing in Ottawa, too; it’s an accessible sport that rewards technique, and it’s completely accessible to people in wheelchairs or with limited mobility. 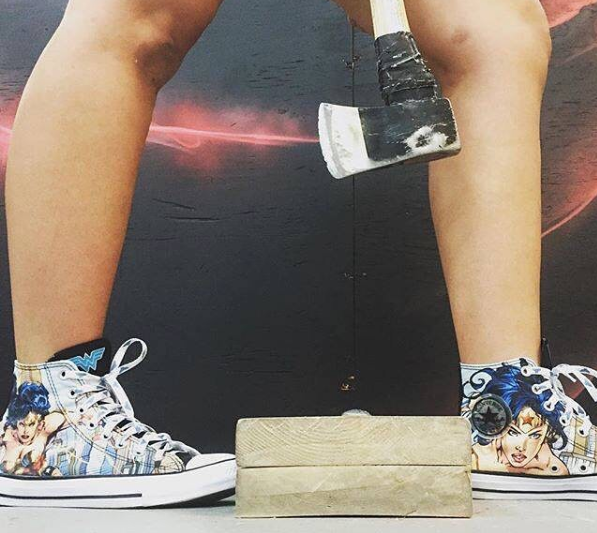 The emphasis on technique over strength may be one of the reasons that their league is co-ed, and why people from all kinds of professions and backgrounds decide to blow off steam after a long day on the job by throwing axes. You don’t have to complicate things either by booking an axe throwing venue followed by a casual place for dinner and drinks; BATL’s Ottawa location is licensed and has a partnership with Milano’s Pizzeria, meaning you can kick back, carefree, with a few beers and finger foods and enjoy the night. The end of the year is hard enough on everyone; don’t let your hair go grey trying to plan an elaborate or expensive holiday party. Axe throwing is the hit new destination in Ottawa that everyone is sure to enjoy, just make sure you book in advance.